WASHINGTON — Four Washington Nationals players have been selected to represent the National League at the 2016 Major League All-Star Game in San Diego, California. Reigning NL MVP Bryce Harper was voted in as a starting outfielder, while second baseman Daniel Murphy, catcher Wilson Ramos and starting pitcher Stephen Strasburg were all selected by coaches as reserves. The Baltimore Orioles netted five selections, as Manny Machado was voted in as starting third baseman with outfielder Mark Trumbo and catcher Matt Wieters joining him as reserves. Relief pitchers Zach Britton and Brad Brach were also selected. 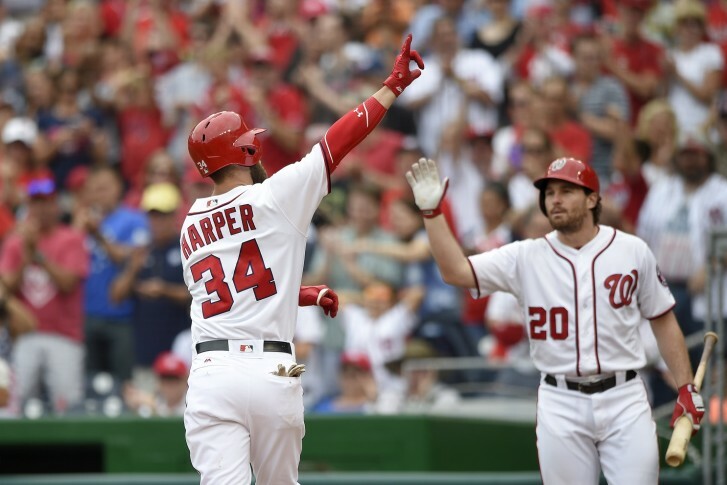 The four All-Star selections match the most in Nationals franchise history since the move to Washington. In 2012, Ian Desmond and Gio Gonzalez joined Harper and Strasburg. The Montreal Expos had five selections in 1982, 1983 and 1994. Harper, still just 23, is headed to his fourth midsummer classic. He has reached the All-Star Game every year except 2014. This is Murphy’s second All-Star selection, having also made the game in 2014. He leads the league in hits (.108) and batting average (.347) just past the midway point of the season. Ramos is headed to his first-ever All-Star Game after posting by far the best numbers of his career. After never batting better than .272 for a full season, Ramos is hitting .340 and is just three home runs shy of his career high through 70 games this year. He leads all big league catchers in average, on-base percentage and slugging percentage. Strasburg is headed to his second All-Star Game and his first since 2012. He is a perfect 11-0 through his first 15 starts, sporting a rotation-best 2.71 ERA. With his selection, Strasburg will return to his childhood home of San Diego, where he also attended college at San Diego State.